The Sage-ARTS Collaborative is a partnership between the Sage Project and A Reason To Survive. 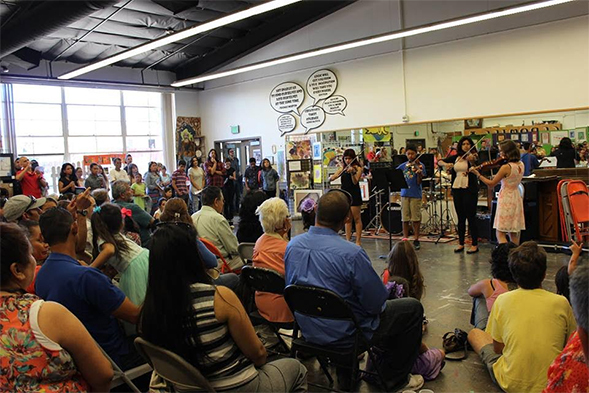 Through this collaboration, SDSU music students are afforded valuable teaching opportunities to at-risk children, teens, and young adults in National City. This partnership, which began in 2015, has been supported by the Aztec Parents Fund and the Parker Foundation Grants for Public Good to the SDSU College of Professional Studies and Fine Arts. The Sage-Schools Collaborative is a research-to-practice partnership between the Sage Project, the San Diego Unified School District, and SDSU’s Phonological Typologies Lab. Through this partnership, we are collaborating with speech-language pathologist Jennifer Taps Richard and other school practitioners on a sustainable model of evidence-based management of speech sound disorders in the schools. The research collaboration, which launched in 2018, has been approved by the San Diego Unified School District Research and Evaluation Office and by the SDSU Institutional Review Board. Combiths, P., Barlow, J.A., Taps Richard, J., Pruitt-Lord, S. (in press). Treatment targets for co-occurring speech-language impairment: A case study. Perspectives of the ASHA Special Interest Groups. Combiths, P., Taps, Richard, J., Pruitt-Lord, S.L., & Barlow, J.A. (2017, November). At the intersection of speech and language: A word-final treatment case study. Poster presented at the Annual Convention of the American Speech-Language-Hearing Association, Los Angeles. Taps Richard, J., Barlow, J.A., & Combiths, P. (2017, November). Applying phonological complexity in the schools: Insights from 32 case studies. Presented Annual Convention of the American Speech-Language-Hearing Association, Los Angeles.